Improve your crop management strategy. 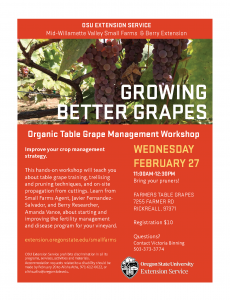 This hands-on workshop will teach you about table grape training, trellising and pruning techniques, and on-site propagation from cuttings. Learn from Small Farms Agent, Javier Fernandez-Salvador, and Berry Researcher, Amanda Vance, about starting and improving the fertility management and disease program for your vineyard.